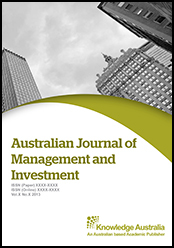 The Australian Journal of Management and Investment(AJMI) is an international peer-reviewed academic journal dedicated to the latest advancement in this area. The goal of this journal is to provide a platform for Management and Investment researchers, policy makers and academics all over the world to promote, share, and discuss various new issues and developments in related problems. The scope of the journal includes (but not limited to): Business process management, strategy, strategic management Computer sciences, data warehousing/mining Decision analysis, soft decision making Engineering management, financial/industrial/marketing engineering Information systems and technology Interdisciplinary management, knowledge management Mathematics, operations, operational research/management Multidisciplinary research Organisation performance Political science, public sector Production/supply chain management Psychology Quantitative/qualitative methods, statistics Revenue, risk, services management Social issues, investment theories and case studies.